Beautifully engraved certificate from the Studebaker Corporation issued in 1950's. This historic document was printed by the Security-Columbian banknote Company and has an ornate border around it with a vignette of an allegorical man sitting inside a factory. This item has the printed signatures of the company’s president and secretary and is over 36 years old. 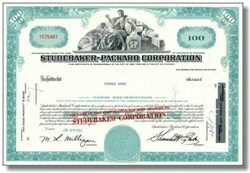 The name Studebaker Corporation is over printed in red on the face of the certificate to show the name change from Studebaker Packard. They did this to save the cost of printing new certificates. The Studebaker brothers made the determined march from village blacksmith to industrial giant. In 1852 Henry and Clem Studebaker opened a blacksmith shop in South Bend, Indiana. By the Civil War the shop was supplying wagons to the U.S. Army. In 1868 four of the brothers established the Studebaker Brothers Manufacturing Company. Despite setbacks, the Company grew to be the largest wagon factory in the world, delivering on its motto, "Always give more than you promise." Studebaker put all its resources into automotive manufacturing. From the 1920s until its closing in 1966, Studebaker Automotive was a leader in styling and engineering. Many of the famous designs that rolled off the South Bend assembly lines are now an important part of our country's automotive history. The legacy lives on Studebaker was the only company to span the time from settlers' wagons to high performance automobiles.